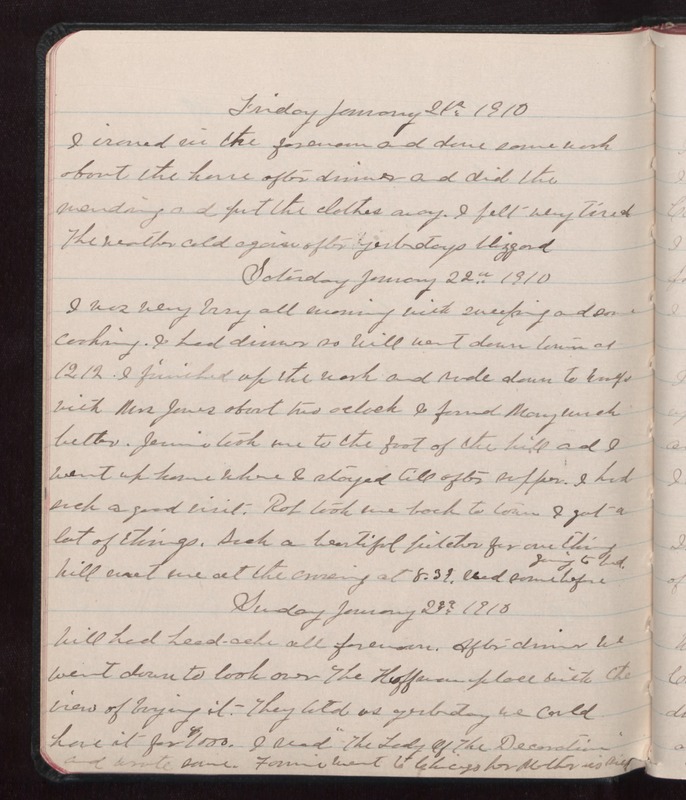 Friday January 21 1910 I ironed in the forenoon and done some work about the house after dinner and did the mending and put the clothes away. I felt very tired The weather cold again after yesterdays blizzard Saturday January 22 1910 I was very busy all evening with sweeping and some cooking. I had dinner so Will went down town at 12.12. I finished up the work and rode down to Mary's with Miss Jones about two oclock I found Mary much better. Jennie took me to the foot of the hill and I went up home where I stayed till after supper. I had such a good visit. Rob took me back to town I got a lot of things. Such a beautiful pitcher for one thing Will met me at the crossing at 8.39. Read some before going to bed. Sunday January 23 1910 Will had head-ache all forenoon. After dinner we went down to look over the Hoffman place with the view of buying it. They told us yesterday we could have it for $1000. I read "the Lady of the Decoration" and wrote some. Fannie went to Chicago her Mother is sick.